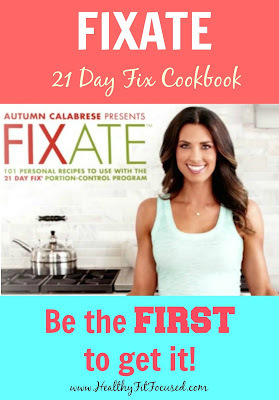 Healthy, Fit, and Focused: FIXATE 21 Day Fix Cookbook is HERE! Ok, your wait is over! The Fixate Cookbook is finally here! You can get your copy TODAY! Here's what you'll need to do. First if you don't already have a coach, follow this link to create your free Beachbody account. This will make me your coach and make it possible for you to get the Fixate before others who don't have a coach!! Then, to ORDER your 21 Day Fix Cookbook, FIXATE, click the image below!! You'll be cooking like a 21 Day Fix PRO in NO TIME! If you're ready to start your health and fitness journey and take that leap of faith then I'm inviting you to join my Jiggle Free July challenge support and accountability group starting on July 20th. In order to participate in the group you will need to purchase the 21 Day Fix Challenge Pack which includes the 21 Day Fix and 30 day supply of Shakeology!